The IPO Campaigns and Education team have had the pleasure to work with both when promoting IP to schools, as well as Shaun the Sheep! Our role at the Intellectual Property Office is to work with schools, young people and consumers to raise awareness of and respect for intellectual property. Our aim is to inspire young people aged 4-18 years old to learn how IP impacts on their everyday lives. From the films they watch to the music they listen to. We've developed a wide range of educational resources for young innovators. These include online games and an app which all fall under the Cracking Ideas programme. This is an initiative which began some 7 years ago. We teamed up with Wallace & Gromit to provide both an online resource for schools and an annual design competition. The first ever winners of this competition invented the 'Waker-up 3,000'. Former MP Ann Widdecombe wore it when she appeared as a guest on the BBC TV series 'Have I Got News For You'. We are also lucky to have some top creative partners. With Fun Kids Radio we developed and launched 'Nancy and the Meerkats', a pop group that are about to make it big. A radio series followed Nancy and the band as they overcame the different types of intellectual property in setting up their band. With our friends at UK Music and Aardman we developed a free gaming app called Music Inc. It gives players an insight into the the challenges faced by musicians in the digital age. We are delighted to have been nominated for a British Interactive Media Association (BIMA) award for this venture in the youth engagement category. Fingers crossed we will win. We'll find out on 18 September - we only have to beat Channel 4! The app is educational, but it's also great fun. I would have loved a game like this when I was growing up. We are thrilled with the positive response we’ve had. To date over 31 million songs have been created with nearly 960,000 number 1 hits. Importantly, we have seen a change in players’ behavior - over 76% of those playing show positive piracy choices when releasing a single. If online games are your thing then have a go of our Wallace & Gromit online games - 'Invention Suspension' and 'Sprocket Rocket'. You get to learn about intellectual property and are fun to play - over 35 million game plays to date say so! We are about to take a break from our favourite inventing duo having recently announced a new partnership with Wallace & Gromit’s Children’s Charity & The Grand Appeal. This new national school's programme; Shaun's Cracking Ideas Design Challenge, will launch mid September. Running alongside this, BBC children's TV character Shaun the Sheep will take centre-stage in a major public arts trail taking place in 2015. We will provide schools across the country with a free interactive activity pack full of challenges. This includes an exciting design competition to inspire children and young people to come up with new inventions to transport Shaun out of the city. Our lesson plans will help children learn about the personal and economic value of intellectual property in a fun way. They will also learn how to protect their innovations through the correct use of patents, trade marks, designs and copyright. 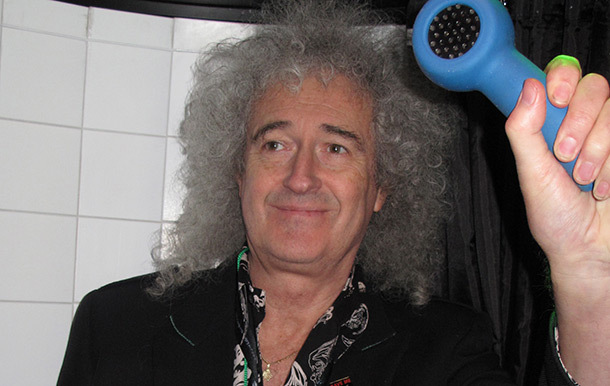 If you think you have the musical talent to follow in the footsteps of Brian May, Oritse, the Haarlem Globetrotters, government ministers and MP’s then look out for our Karaoke Shower. The 2014 tour starts in September at the Big Music Project, Glasgow. It would be great to see you there!